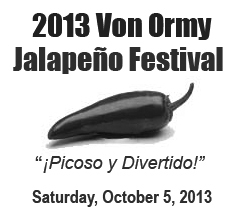 VON ORMY– The Von Ormy Jalapeno Festival is back!. Residents will once again be able to sweat out the jalapeno eating contest due to a new coalition of organizers. The festival will be held this fall on Saturday October 5, 2013 on the grounds of Sacred Heart Church in Von Ormy. The festival was revived due to a new partnership with American Legion Post 466 (Von Ormy) and American Legion Post 485 (San Antonio). City council approved the partnership at its April 3 meeting. The festival has traditionally been operated by the Von Ormy Community Foundation and the City. This year the American Legion Post 466 will take the co-ordination lead and share in the proceeds. Von Ormy’s Post 466 was established under the leadership of Charles Hanson in recent years. At the festival committee’s first organizational meeting it was decided that the festival will open with a prayer service in the City Park at 8:30 a.m. The parade route will differ this year as well and will process through the city from the new City Park to the festival grounds. The parade lineup will be at the City Park for the first time. Organizers are planning for the biggest festival to date with increased selection of music, food and fireworks. Other partners will assist with the festival. Sacred Heart Church will run the bingo games and the trail rides. The Von Ormy Historical Society will once again name a Count and Countess for the Festival.